Home / Columnists/ On which “beast’s” back does the burden of governance (not) rest? On which “beast’s” back does the burden of governance (not) rest? I was very hopeful when circumstances necessitated a national government of sorts in a hazy summer concatenation now long forgotten. At the time, we all thought the union of two major mainstream mindsets would result in a smorgasbord of good things – governance included. There would be a unitary vision; a joint effort at ensuring things were done in a unified national interest; a strategic streamlining of mission and passion just short of symbiosis whereby all would be well in the many spheres where we the people had mandated our servants – our elected representatives who would appoint their own mandarins and govern out of sight, out of mind, until we were called on to replace them… Or endorse another term, depending on their performance in the honeymoon period – and beyond – into their unusual but welcome political alliance. Or so we thought, being idealistic; hoping that the beast with two backs being made by previously implacable foes would ally our aspirations for ‘peace with justice’ with their political ambition to do or be damned – but both parties proved to be a disappointment; with neither beast providing a platform for the people’s hopes; just oxen pulling in different directions, and bellowing about hardly anything worth bothering about. Politicos are often mouthpieces for their respective political parties, as well as their more powerful patrons with hidden agendas and vested interests. However, when they utter utter inanities or patent absurdities, the public are compelled to draw a firm but fair line. Despite the seeming meaningfulness of the sentiments expressed by a brace of ministers recently, there is far more significance to their utterances than might immediately meet your eye. How lame it is when the less than honest horse hustler rails against the crooked cattle wranglers on the adjoining ranch. Hearing a minister who has done the rounds, politically speaking, laying down the law unequivocally on a matter of fiscal and fiduciary ethics reminded me that those who live in barns should not throw dung… unless they expect bovine excreta to be thrown back at them… until the Augean stables of their own as well as joint and mutual making are cleansed, they would do better to hold their peace. That the minister in question is concerned with fraud and financial crime and punishment is commendable. If only the minister and the politico-legal machinery he is speaking on behalf of were to put their money where their mouth is, it would be far more credible and worthy of the headlines he made in essaying his fait accompli. According to Minister Mahinda Amaraweera, the government’s good intention is to prosecute politicians and public servants who misuse public funds, and abuse (or let fall into disuse) the state’s national resources. Does he know – as Virgil did, because the road was smooth then as now – that the path to hell is paved with mere good intentions? The minister added that his administration would not permit the perpetrators of fraud and/or other financial crimes (as well as a spate of corrupt practices) to roam free… but would take legal action against them… Which is all well and good… but how can and must he and his naïve ilk account for the inordinate number of sharks and big fish at large to enjoy ‘life, liberty, and the pursuit of happiness’ – while sprats and minnows languish in gaol… for petty misdemeanours as much as incurring the wrath of the present powers that be? The Founding Fathers of our Democracy must shudder that ’twas ever thus… one revengeful regime no more noble or pure than the other honourable administration of doubtful probity! In a statement virtually guaranteed to make the minister regret his pronouncement, he further asseverated (with an emphasis on the first syllable): “We will ensure that if and when found guilty, those wrongdoers who are discovered breaking the law will be jailed for seven to eight years at the very least.” Maybe he forgets that the law and the lapses of its enforcement – like love, as Jesus said – cover a multitude of sins… So he’s sitting pretty in asserting (again, the same emphasis) that with the sitting president, there would be no let up or lacunae in law enforcement. Perhaps the Lord Archer model of politicians doing penance in prison would suit some of the minister’s fine-feathered friends better – if only the ruling party would be humble enough to turn the spotlight on themselves! 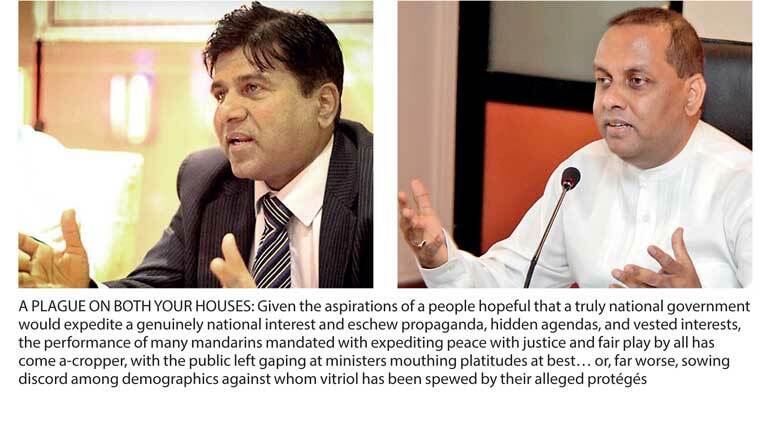 Not one to beat about the bush, the minister went on to declare that Yahapalanaya’s ostensibly sea-green (with a dash of pea-blue) incorruptible administration was not established to protect thieves, rogues, and sundry scoundrels – but to prosecute them. And I can just hear JFK’s Marilyn Monroe saying in the background, “Yes, son, that’s all well and good, but first you have to find them.” She had another piece of advice which might also suit our punitive panjandrums thumping the drum on finding out who’s been naughty and nice… “I am trying to find myself. Sometimes, that’s not easy…” – can the do-gooder declaratives take a look in the mirror, please? Thus we all know – as the erudite and well-informed minister does, having the facts at his fingertips – that, currently, “several cases of fraud and corruption are being investigated”; and, presently, “some of the miscreants have been produced in court”. Well, who is he trying to impress – Jesus, or Jeffery Archer? And just who does he think he or the president are – Virgil? Churchill? JFK? Therefore pardon my faith in platitudinous law-enforcement by law-abiding politicos if I and my dog (Greek, “cynos”) remain cynical (English, “doggedly despondent”). We are down in the mouth about much else that ails the republic these days. Not least of which is a minister wearing two hats who can’t seem to quite make up his mind whether to be an idiot about one portfolio while being an ideologue about another, and (in the limit) utterly idiosyncratic about both. Ideally, a servant of the people cannot serve two masters – the state as well as self… And if only the minister in question could muster enough honesty to master the principle that he is a servant of the people and not a slave to any perverse ideology founded on ethno-nationalist chauvinism (in the guise of protecting a special interest group), he could still do justice to one – if not both – of the ministries than come under his purview. But a peculiar keenness to curry favour with the prelates – perhaps with an eye on present or future portfolios, maybe even that of the Mikado himself under an emerging power bloc in the emerging blue party – has compromised his common sense as much as his usually calm demeanour and sense of composure on matters of national interest. Despite being a highly-respected legal eagle in certain circles, and notwithstanding his stature as a leading business magazine’s erstwhile ‘Sri Lankan of the Year’, Justice Minister Wijeyadasa Rajapakshe is showing an rather unsettling tendency to run with the hare and hunt with the hounds. Which prompts me to ask: Who let the dogs out – again? Why at this time… Where is the much vaunted law and order we relied on? How is it that those masked men with hidden agendas and vested interests can cry, “Havoc!”, and let slip the dogs of war… and no less than the justice minister of a democratic-republic be seen not to be on the side of the angels? And, in fact, on the contrary, rush in where devils fear to tread? When will albeit powerful ministers learn that portfolios are temporary; fame or even notoriety short-lived; and personal peccadilloes while in office the legacy that even the best of well-meaning mandarins leave behind?